NEW SPRING TRAINING DATE ANNOUNCED! If you’re looking for a resource base to assist you with your decorative concrete jobs, you’ve found the right place. Aside from being a product supply store and functioning fabrication site, our main Toronto and GTA location is also a first class, certified training facility. We have the talent, resources and industry experience required to, not only identify the right products for your project, but also show you how to use them properly. From time to time, we conduct short product demonstrations for individual and/or small groups of customers. In conjunction with the instructions, videos and technical data sheets available throughout the sections of our website, these quick face to face tutorials are designed to provide the basic techniques needed to get you started with initial projects. Don’t hesitate to call us if you would like a quick lesson on any of our products. This in-depth 1-day course is designed to introduce and familiarize you with the techniques used for the Xtreme Series Precast countertop casting system. 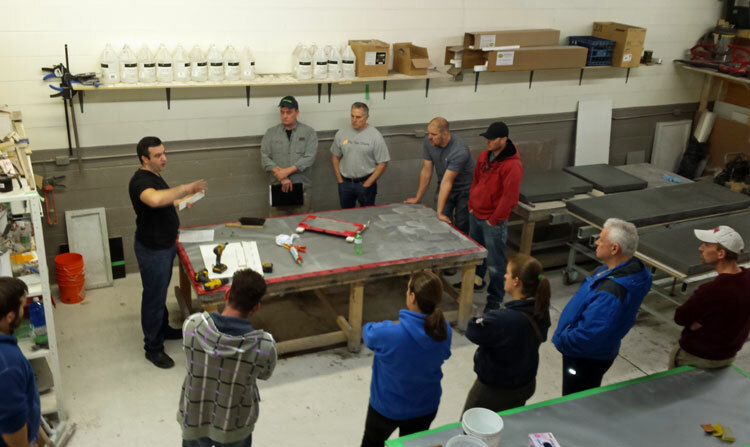 At the end of the training, you will be able to form, pour, sand, and seal, amazing countertops, tiles and panels, using the most versatile and technologically advanced GFRC decorative concrete material on the market! Students will be provided with copies of comprehensive, instructional Technical Data Sheets and Fabrication Tip Sheets for the products and techniques demonstrated during the training. Join us for a challenging and rewarding exploration into the creative and lucrative world of modern precast concrete! This 1-day course will teach you how to clean, repair, refinish and re-color interior and exterior concrete surfaces that are showing their age. We’ll walk you through all the steps required to give your existing concrete a new, beautiful, long lasting, strong, UV and weather resistant resurfacing. – Selecting the right Sealer or Coating to protect your concrete. Students will be provided with copies of instructional Technical Data Sheets and Application Tip Sheets for the products and techniques demonstrated during the training. Join us for a challenging and rewarding exploration into the creative and lucrative world of modern concrete resurfacing!